General Purpose Plug Designed to Protect Threads, Ports or Fittings from Damage, Debris and Contaminants. Not sure what part you need? Would you like to consider another type or part, or a different material? Consult MOCAP's Application Advisor for assistance. 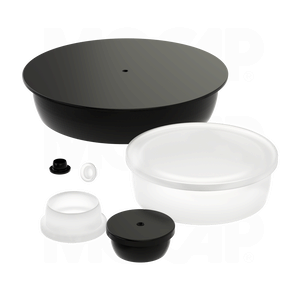 MOCAP Barrel Plugs with a Flange are general purpose plugs designed to fit many different non-threaded and threaded sizes and styles, allowing for maximum flexibility. Easy to apply and remove, their convex body holds them firmly in place. Many Sizes of Our Barrel Plugs with Flanges are Stocked for Immediate Shipment. Most stock sizes are available in Mini-Packs when Smaller Quantities are Needed. To place an order for this product, call 0800 856 2466 or use our Contact Request Form to receive information by e-mail.